When it comes to good quality socks for men, even a few pairs of them are never enough. 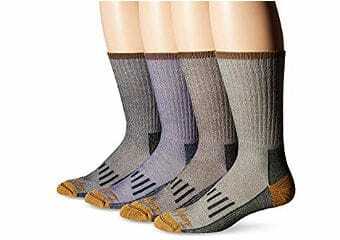 Here we will show you and review some of the best cotton socks for men to help you renew your selection, shorten your ¨urgent things to buy¨ list or even provide you with some great options if you are thinking of offering cotton socks as a gift, which is always a much appreciated and useful present to take. 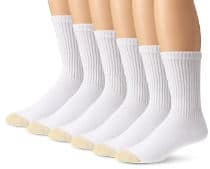 We all know that cotton is one of the best material for socks, it is fast absorbing, healthy and is especially recommended for short periods that your body produces excessive sweat. 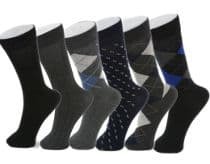 So, in this review I have selected various top reviewed cotton socks for men in different lengths, styles and colours, and who knows, maybe your next most favorite pair of socks will be in this following list. So, let´s have a look! 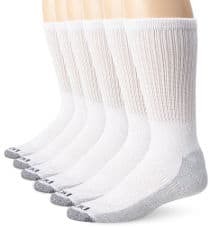 The Fruit of The Loom Men’s Socks are 9.75 inches ankle high and come in a pack of 10. They are made of 85% Cotton, 13% Polyester, 1% Spandex and 1% Fiber. They are available in sock size 10-13 and shoe size 6-12. They also have reinforced heel and toe to give them long lasting life. The cotton feels quite soft when you wear it and they are made in the USA which is nice to see. According to the users, they fit to size and they can also be used as running socks since there is no slippage inside the snickers. The Gold Toe Men’s Cotton Crew Athletic Sock is available in various colors and some patterns, too. Also, plenty of sizes available to suit your size. Here it is worthwhile mentioning that the construction of the fabric is different according to the color and you will have to check that before buying. For example, the black color socks are made of 78% Cotton, 1% Polyester, 19% Nylon and 2% Spandex. The toe is reinforced and not the heel, they come in a pack of six pairs and can be washed in the machine. Overall, they get fantastic reviews with a vast majority of people loving this product. 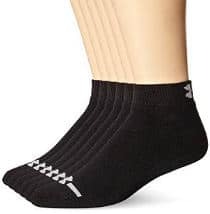 The Hanes Men’s 10-Pack Ultimate Crew Socks is another very well liked product by the users.The reviews are fantastic and most people give it very high ratings. These athletic crew socks are machine washable. They come in a pack of 10 and with an added feature of reinforced toes and heels. The heel and toe of the white sock is in gray color. The Under Armour Men’s Cotton Socks are available in black and white, and have a nice little pattern on the toes. They come in sizes medium / large and the users say that they fit to size as it was expected. This is a low cut sock covering your ankles. It is made of 79% Cotton, 17% Nylon, 3% Polyester and 1% Spandex. It comes in a pack of 6. It can also be used as a running sock by athletes as the company claims that it helps prevent the growth of odor-causing bacteria in the sock. Overall, this product attracts very high ratings and reviews. 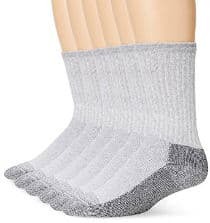 This Hanes Men’s 10-Pack Classics Socks are in black, white and gray colors. They are made of 80% Cotton, 16% Polyester, 2% Natural Latex Rubber, 1% Spandex and 1% Other Fiber. The sizes available are 10-13 and a large majority of users are happy with the sizes and say that the socks fit well. They also have a thicker cushioning which helps to keep your feet soothed even after long walks or running. The heel and toe is extra tough to give it a longer life and the stretch cuffs will hold well so you don´t need to keep pulling them up. 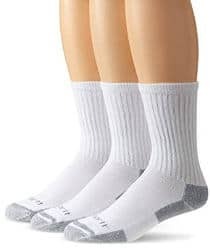 The Dickies Men’s Comfort Crew Socks is another extremely popular product gathering a large number of positive reviews. It is made of71% Cotton, 27% Polyester, 1% Nylon and 1% Spandex. It can be machine washed and is available in black and white with a contrasting color on the sole which looks quite nice. The fabric has been engineered to provide good air circulation and control the moisture of your feet. It also has a cushioned sole on the entire bottom of the sock which gives a smooth and spongy feeling. The heel and toe is also reinforced for maximum durability. A great majority of customers love this sock and I think you will, too. 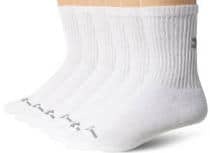 This Carhartt Men’s 3 Pack Work Sock is sold in white, black and gray with an extended reinforcement around the heel and toe. It has a nice looking pattern in gray around the heel and toe with the Carhartt logo being just above the toes. The stretch material will give you a comfortable fit and a good feel. The manufacturers provide extra padding to offer good protection and make it long lasting, giving you good value for money. The company also claims that they are odor protected but I am not sure up to what extent. 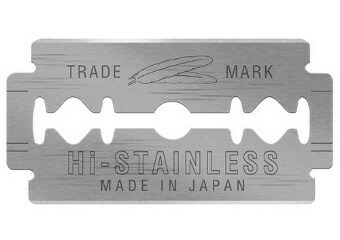 It´s good to see that they are made in the USA. This Alpine Swiss Men’s Cotton Dress Socks have a nice looking Swiss style pattern which can be used for casual and formal wear. Each pack of six that you order contains a mix of Argyle, Ribbed and Solid Patterns giving you a good variety in the pack. They are 10 inches high reaching the middle of your calf and the available sizes are 6-12 (shoe size). This is a thin sock which also makes it comfortable to wear. The construction of the fabric is73% Cotton, 26% Polyester and 1% Elastane. The cotton is supposed to be breathable to prevent odor and give comfort. 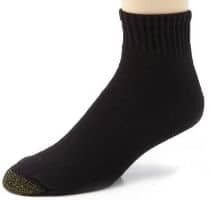 These No Show Cotton Socks for Men are made of 85% cotton which will keep your feet cool and relaxed. They are available in 5 colors, white, grey, khaki, khaki green and black, and they are suitable for any type of snickers. They are non slip. Slippage is usually the problem with the ¨no show¨ socks but judging from the feedback, users appear to be very happy with this feature. This product gets a huge amount of very positive reviews and it was hard to find any negative review. 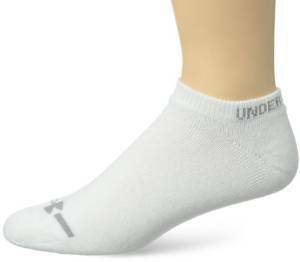 This Under Armour Men’s Cotton Crew Socks are in black and white only. They have a neat little pattern in contrasting color just above the toes. The cuffs are ribbed to provide good comfort and the sock is made of 79% Cotton, 17% Nylon, 3% Polyester and 1% Spandex. The height is 12.5 inches and it fits to size. This is a pack of six pairs of socks and there is an incredibly large number of reviews with most of them being way above average. These Men´s 100% Cotton Plain Socks are only available in black and suitable for some of us who prefer to wear 100% cotton only. They are machine washable but it´s advisable to wash in 30 degrees. The fitting is quite comfortable and they can be worn for work or casual wear. They do get somewhat mixed reviews, though. Whilst some people really like this product, others were not so happy with the quality. The general feedback is that if you do a lot of walking, they may wear out quicker as they are quite thin. These Under Armour Men’s Charged Cotton Socks are no-show as they barely reach the ankles. The fabric consists of 79% Cotton, 17% Nylon, 3% Polyester and 1% Spandex. They also have an Under Armour logo on the ankle. The socks are soft and thick enough to fit nicely. They are good for work and casual wear or for wearing around the house. Users comment that the texture has not lost its feel and quality even after multiple washes. The Dockers Men’s Sport Crew Socks come in different shades and Dockers also offer you an assorted color pack of 5 pairs. The fabric is 80% Cotton, 18% Nylon, 1% Polyester and 1% Spandex. The cuffs are ribbed to stay up and with a cushioned sole. The overall users´ feedback is extremely positive but there were also some users that were very unhappy with this product. 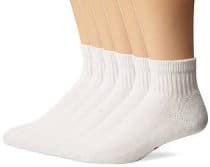 The Fruit of the Loom Men’s Crew are heavy duty socks and get a large number of above average reviews. They are only available in light gray with a contrasting darker gray on the entire sole from heel to toe. 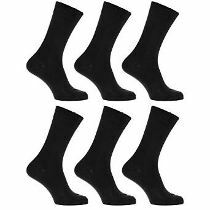 This pack of 6 crew socks is cushioned for comfort and reinforced for durability. It is made of 76% Cotton, 22% Polyester, 1% Lycra Spandex and 1% Other Fibers which should withstand the toughest work conditions. They are heavy and good for daily wear but I am not really sure if they are suitable for very cold weather. The Perfectday No Show Cotton Socks come in 6 attractive colors with some of them being very modern and bright. They are also 85% cotton to keep your feet comfortable and cool. The customers´feedback shows that they are quite long lasting. They have a large silicon grip on the heel to prevent slippage and the company guarantees that. If you have any problems, they offer to send another size without any extra cost. Other than changing the size, they also offer no questions asked full money back guarantee if you are not satisfied with the product. Finally, it comes in a pack of 3 and for that price it´s a real good deal. 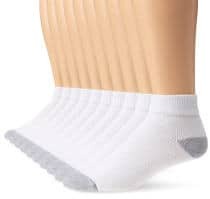 The Hanes Men’s Ankle Socks come in white color with a gray on the heel and the toes. The toe and the heel is reinforced for extra durability. They are machine washable and the fabric is 75% Cotton, 21% Polyester, 2% Rubber and 2% Fiber. They come in a pack of 10 and they are a great value considering that a piece only costs $1. So, you really can´t go wrong if you are looking for a low price cotton socks. 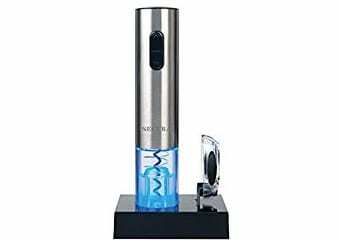 This product gets an extraordinarily large number of reviews with the majority of buyers giving it high ratings. Some people say that they have used it for up to a year before they saw any tear in it. 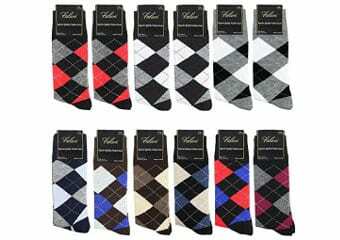 This Marino Men Cotton Socks are very elegant looking and come in lots of patterns and solid colors. 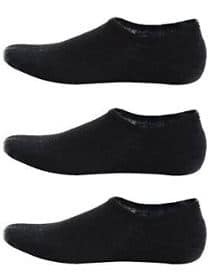 They are suitable for casual as well as formal wear and available in a multi pack. The styles are enough to match up with different items in your wardrobe. 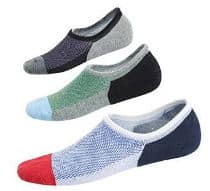 They are comfortable as well as extremely breathable and the company claims that they guarantee fresh and dry feet when you wear these socks. They also offer a 30 day free exchange and return policy. The reviews are really fantastic and a great majority of users love these cotton socks. The FUN TOES Men’s Cotton Socks are very stylish and modern looking. 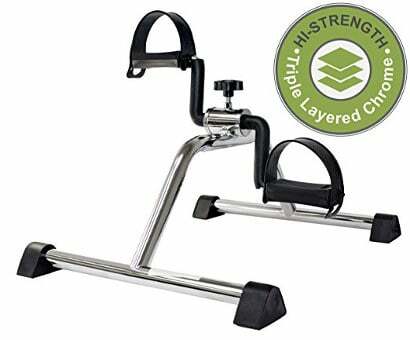 You can tell just by looking at them that this is a superb quality product and the reviews of the users confirm that. It is made of 82% Cotton, 12% Spandex and 6% Elastic, and has a mesh fabric on top for easy breathability. Each toe is separated like you are wearing a glove. It is also ideal to be used as an athletic running sock. The fabric is such that would not gather any sweat. You have got to see the design and I am sure you will love it. These Hanes Men’s Classic Socks come in black and white only. The height is quite short and they would not show above the shoes when you wear them. The construction of the fabric is 63% Cotton, 34% Polyester and 3% Fiber. They are machine washable and come in a pack of 6. They have a cushioned sole and the toes are reinforced to give a long lasting use. Having a ribbed cuff will ensure that they always stay up. The majority of the reviewers give above average ratings. However, I also came across some comments by users that they were very unsatisfied with the product. The Wigwam Men’s Super Socks are made in the USA and they are only available in white color. The fabric consists of 86% Cotton and 14% Stretch Nylon. They are also fully cushioned to provide you with maximum comfort. This product attracts a large number of reviews and the users give it very high ratings. 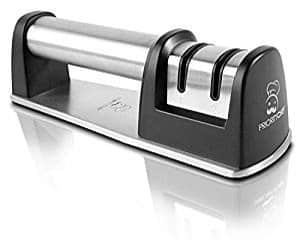 It comes in a pack of 6 and the price is not so economical but the quality and durability makes it worthwhile consideration. These are slightly thicker socks but don´t feel heavy when you wear them. The Spikerking Men No Show Cotton Crew Sock is a very eye catching sock and a great buy. 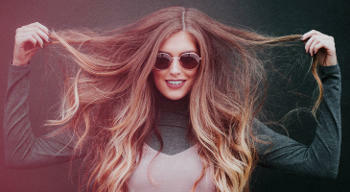 They are made keeping in mind the latest design and style to give you a modern look. The fabric has gone through a terry knitting process which helps to absorb sweat, making them suitable to be used as running socks. Also great to wear them at home to lounge around. The package includes 3 of different colors. Although not the cheapest price, when you see them, you would know that they are worth the price. The Gold Toe Men’s Cotton Quarter Athletic Sock gets hundreds of very positive reviews with lots of satisfied customers. They had some quality issues some years back and some of those negative reviews are very old but it appears that the company has taken care of that now. This product is 100% cotton and suitable for some of us who prefer to wear just cotton. It can be machine washed. It is available in black and white with a contrast color and design on the toe. The cuffs are ribbed knit to hold them in place while the heel and toe is reinforced to provide all day comfort. 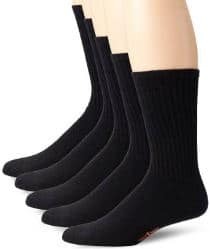 All in all, if you have been looking for the best cotton socks for men to buy for yourself or offer as a gift, here we have presented a great selection of cotton socks with top reviews as well as nice quality and style.